I created this dish for the 1, 2, 3 Cook & Snap Recipe Contest sponsored by The Foodie Blogroll. Each month, participants are asked to create a signature recipe using three ingredients. This month's ingredients were--in the spirit of Valentine's Day--chocolate, strawberry, and cinnamon. Immediately, I knew I didn't want to make something sweet. Too obvious, right? But, how could I combine such desserty ingredients into a savory dish? The answer: Mole and salsa. The word mole comes from the Nahuatl word molli, meaning "concoction." The majority of people respond, when mole is mentioned, with "Oh yes, I know--that chocolate sauce. […]" Well, it isn't a chocolate sauce. One little piece of chocolate (and in Mexico we used to grind cacao beans for the mole) goes into a large casserole full of rich dark-brown and russet chiles. […] As in other Mexican sauces, the seasonings and spices are not used with such a heavy hand that they vie with each for recognition, but rather build up to a harmonious whole. For my recipe, I include the chocolate in the form of unsweetened cocoa powder AND chocolate stout beer to braise a big hunk of pork (because, what's sexier than deliciously fatty pork? NOT MUCH). There's cinnamon in there, too, which is traditional for a mole sauce. A sweet and spicy strawberry salsa tops it off. 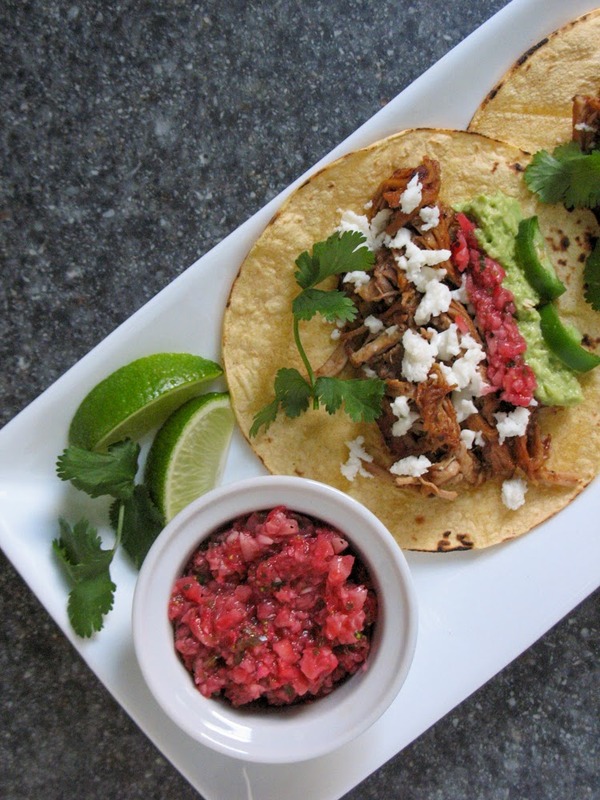 Place the pork shoulder in a crockpot. Combine the rest of the ingredients in a bowl & pour over the pork. Cook on low for 10-11 hours. Remove the pork from the liquid, let cool enough to handle, then shred the meat. Line a baking sheet with a silicone mat or aluminum foil. 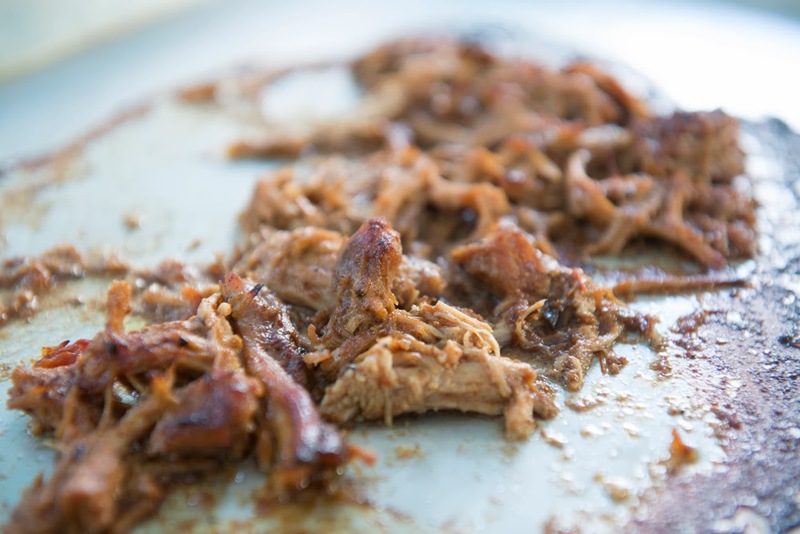 Place the shredded meat on the cooking sheet and pour a few spoonfuls of sauce over the top. Broil for 5-10 minutes or until the edges of the meat brown. Mmmmm….juicy, unctuous, crispy pork. I'm in love. 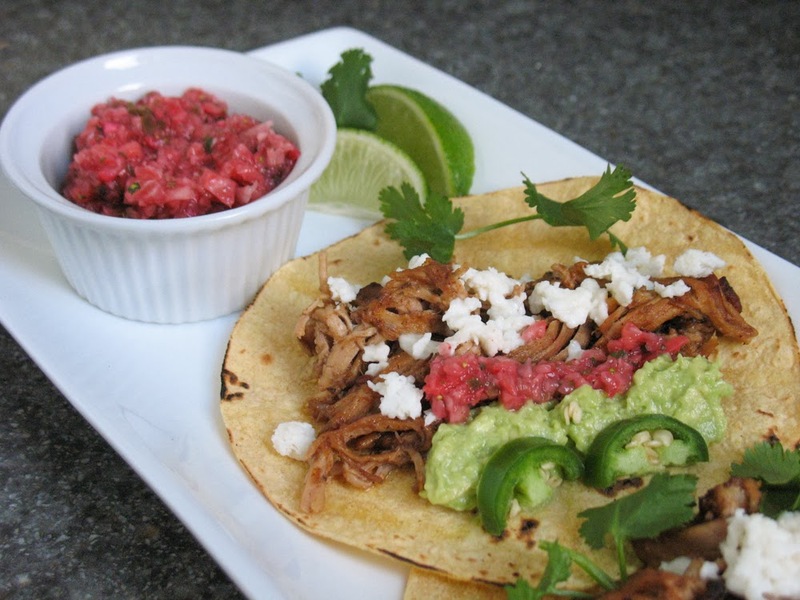 Serve on corn tortillas with strawberry salsa, cotija cheese, fresh cilantro, avocado, sliced jalapeños, and a squeeze of lime. Place all ingredients in a food processor & pulse until desired consistency. I have used strawberries in place of tomatoes before (I am, sadly, allergic tomatoes.) It is interesting how they are really so similar! The recipe looks great, can't wait to try it.